Bain Consulting started a new initiative recently, “The Decision-driven Organization.” I like the idea of looking at a company through the lens of the decisions that it makes. Decision making is where thinking and doing overlap. There is a lot of leverage in that overlap. To quote Bain, “Great organizations make great decisions. They make those decisions quickly and execute them effectively. They don’t spend too much (or too little) effort in the process. 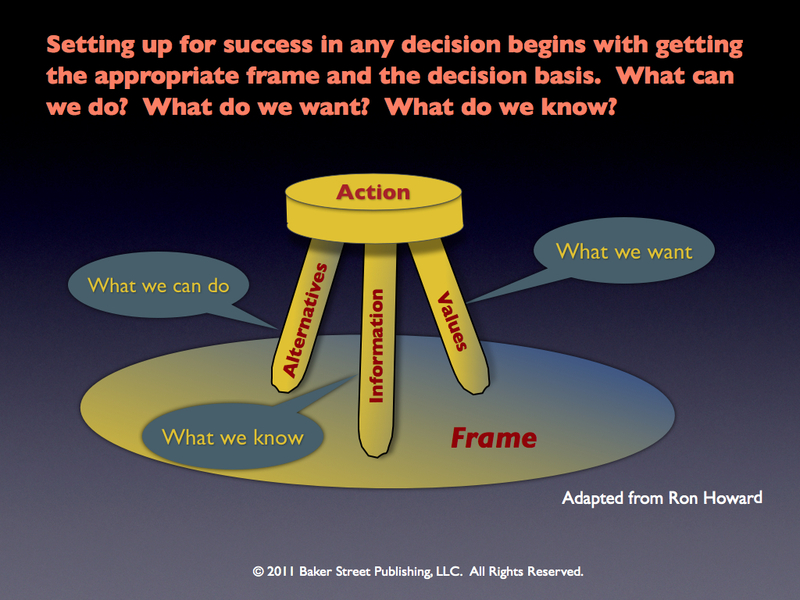 The result: consistently high performance, year in and year out, and motivated employees who feel liberated from decision paralysis.” There is plenty on the Bain website about decision making but I could not find a definition of what a good decision is. Two years ago I looked and I found this statement, “The best gauge of quality [in decisions] is whether in retrospect people believe they chose the right course of action.” I don’t know about you, but this statement leaves me a little cold. It is like saying, “If you think you made a good decision then you did.” Bain must have removed the definition sometime in the last two years. They seem to be learning. When I studied management science and engineering at Stanford in the 1970′s I learned that a good decision is one that is logically consistent with what we know, what we want, and what we can do. The three legged stool is the icon for this way of looking at a decision. The legs are the alternatives, the information, and the values. We really don’t have a decision unless we have all three. The triad, together with the frame it sits on, has a technical name, the decision basis. That’s the way it was taught to me 40 years ago by Professor Howard. That’s the way he teaches it today. The definition certainly has passed the test of time. I have used this definition successfully throughout my 40 year research and consulting career. It is theoretically sound and practical. The implication of Professor Howard’s definition is that we can make better decisions if we improve our logic. For example, in the movie Moneyball, the character played by Jonah Hill showed Billy Bean (Brad Pitt) how he could improve his decisions by taking available player data and combining it logically. Another definition of a good decision that I find compelling is offered by the late Chris Argyris of Harvard. This definition has its roots in organizational development. Argyris defined a good decision as an “informed choice based on valid information.” Further, that a good decision is one where the parties involved are “internally committed to the choice.” People universally agree that we make better group decisions if we think and act according to the Mutual Learning Model shown above. In other words, it takes a combination of logic and mutual learning to make good decisions. As we can see in Moneyball, Billy Bean used logic to formulate his recruiting strategy however his staff were not “internally committed.” The staff deliberately did their best to subvert his strategy. That’s how life in organizations works. Logic alone will not win the day. We need processes and tools for dealing with a broad range of dysfunctional behavior, intentional and unintentional. 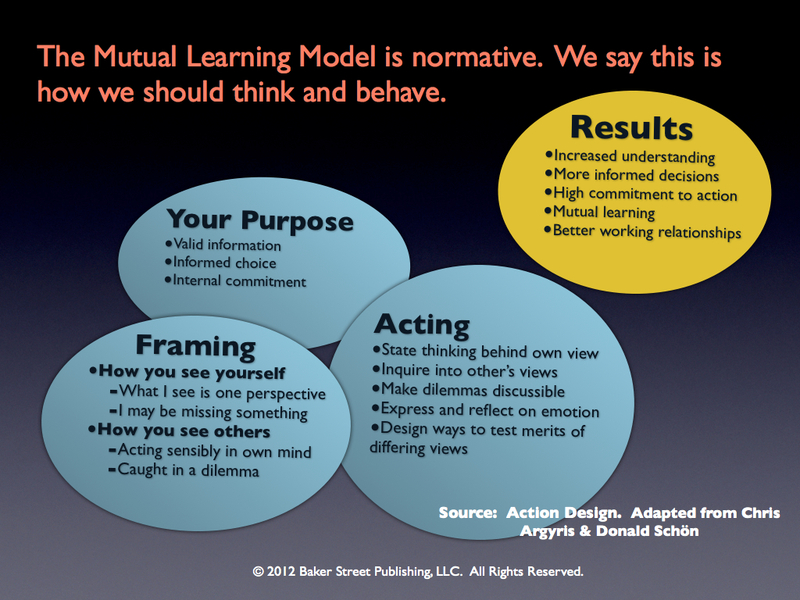 Chris Argyris and his colleagues have developed several tools to help people move toward Mutual Learning. The tools include the ladder of inference, balancing advocacy and inquiry, and the “left hand, right hand columns.” I have found all of them extremely useful.